Griggs County, ND Land Auction - 411± Acres - SOLD!! 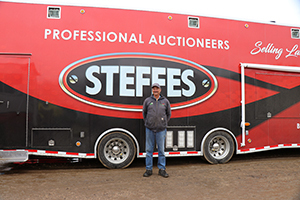 - Steffes Group, Inc. Griggs County, ND Land Auction - 411± Acres - SOLD!! Griggs County, ND Land Auction - 411± Acres - SOLD!! AUCTIONEER’S NOTE:411-acre tract with irrigated cropland adjoining Phelps Lake. This land would make a solid addition to any local producer or an investor looking for land to hunt waterfowl on all the while generating income from the tillable acres. This land is availible to farm for the 2019 growing season! TERMS: Ten percent (10%) down upon signing purchase agreement with balance due at closing in 45 days. AUCTIONEER’S NOTE: 411-acre tract with irrigated cropland adjoining Phelps Lake. This land would make a solid addition to any local producer or an investor looking for land to hunt waterfowl on all the while generating income from the tillable acres. This land is available to farm for the 2019 growing season!